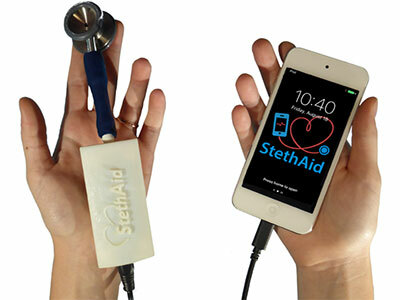 StethAid is a low-cost mobile device-based digital stethoscope that lets pediatric healthcare providers know instantly if a heart murmur is innocent or a signal of a more pathological heart problem. 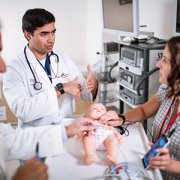 AusculTech DX, a start-up company that formed within the Sheikh Zayed Institute for Pediatric Surgical Innovation at Children’s National Health System, was selected as a Washington Business Journal 2017 Innovation Award honoree for their device, StethAid. 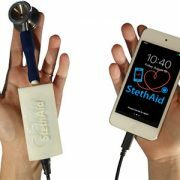 StethAid is a low-cost mobile device-based digital stethoscope that lets pediatric healthcare providers know instantly if a heart murmur is innocent or a signal of a more pathological heart problem. 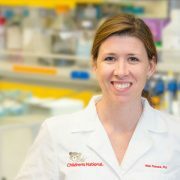 The device was developed by Robin Doroshow, M.D., a pediatric cardiologist at Children’s National, and Raj Shekhar, Ph.D., a principal investigator with the Sheikh Zayed Institute for Pediatric Surgical Innovation at Children’s National to help eliminate unnecessary referrals of patients with Still’s murmurs to pediatric cardiologists. In studying her extensive library of recorded heartbeats, Dr. Doroshow noticed that the Still’s murmur had the same distinct musical tone, regardless of the patient’s age, size and heart rate. When she realized that there was likely a way to teach a computer to recognize the tone, she approached Shekhar with her idea. 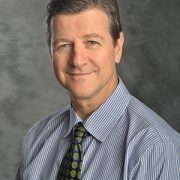 He developed a highly accurate computer algorithm, based on AI (artificial intelligence) principles, to recognize the consistent Still’s tone and worked to develop the digital device. In early 2015, the team formed AusculTech DX. In early 2016, a clinical prototype was developed and they began testing the device. The Washington Business Journal’s annual Innovation Awards honor Greater Washington companies, agencies and teams working to keep the metro on the cutting edge in tech, health care, cybersecurity and more. AusculTech DX was one of the 15 honorees selected for the 2017 Innovation Awards.